I've been rather lax in maintaining this blog over the last couple weeks. I've been trying to pull out of a spell of winter/holiday gloom and convince myself that THIS January ought to be greeted with optimism. January seems to be the month of the year where some kind of trauma and upheaval happens. I could certainly use some upheaval, but I don't need it to be traumatic. I will update later today on where I am with the magazine and my novel, but first, while I wait for the second cup of coffee to take effect, I want to make quick mention of a couple more novels that I've read during the past year or two but which I forgot to include on my "recent reading" list. 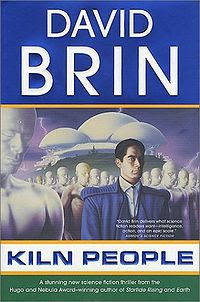 The first is David Brin's Kiln People (titled in England, for some reason, Kil'n People). It's set in an unhealthy future society which is completely rotten with surveillance and social malaise. The premise is that people can create disposable copies of themselves (made of a sort of a clay in a type of kiln) that they can use to perform various tasks. The copies, called dittoes and golems, are producible in various colors, the color indicating how high-functioning they are or what type of work they are typically used for. The copies don't last long, commencing decomposition within a day of coming out the kiln. The memories of their day of life, however, can be uploaded to the original person's brain. This enables some people to spend their whole lives vicariously through their dittoes, and others, like the book's lead character, to get a lot of work done by sending out copies of himself all over town. Albert Morris is a private detective who uncovers a plot by a madman to project his consciousness into space (and killing millions of people in the process). The story line is entertaining enough, and leavened with a good deal of humor, but it's probably less interesting in the end than the kiln people concept itself and the new ways it gives people to deceive and hurt one another. For example: a divorced couple could have a child who gets to spend a day each week with his father; the child is sent out in the form of a ditto which has a great time with dad; mom then denies the memory upload from the ditto to the real kid, thus depriving him of the memory of that good day that he otherwise would have had; her motive is simple spite against the father. That's just one hideous thing that happens in this story. I was reminded of Kiln People by a story that will appear in the first issue of M-Brane which also posits the ability of people to copy themselves, though in a very different way. The other one I wanted to mention and recommend is Michael Swanwick's Vacuum Flowers. Published back in the 1980s, it is a first generation cyberpunk novel and contains some of the earliest talk of wetware. Rebel Mudlark, the main character, is the recorded personality of a dead woman, owned by a corporation which licenses it for entertainment purposes. But she comes to awareness in the body of a woman who rents herself out for wetware testing and escapes into the solar system. She deals with the gradually resurfacing consciousness of the woman whose body she occupies and also a love affair with Wyeth, a man whose personality has been reworked into a committee of four complementary personalities. The milieu of Vacuum Flowers is rather like that of Sterling's Schismatrix in the sense that the solar system has been colonized and numerous wildly different kinds of societies have developed. Their adventures take them to scabrous canister cities in space, a bizarre communistic Mars, space stations in cislunar space near Earth, and down to Earth itself which has been overtaken by a hive mind called the Comprise. 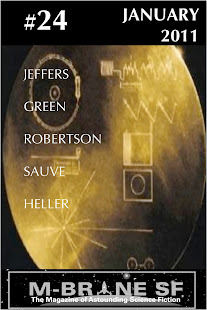 The title of book refers to a space-borne type of vegetation that spreads likes a noxious weed over the surface of can cities and spacecraft. Rebel takes employment for a while, tasked with scraping these away. The cover image of Kiln People is from Wikipedia. I couldn't find one of Vacuum Flowers...and I didn't look very hard. The cover art on the dust jacket of the book club edition that I own is so bad (and has so little to do with the subject matter of the book) that I passed it over for about ten years, letting it languish in dusty neglect.